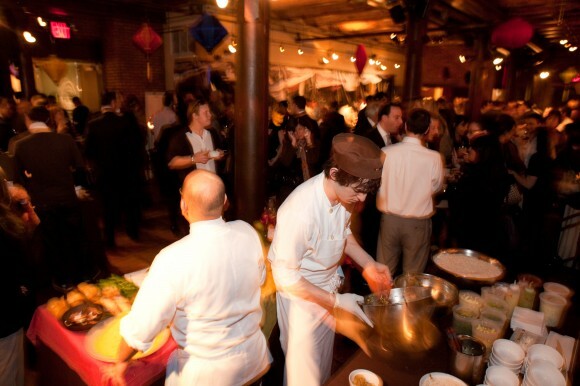 The fundraising event was a who’s who of the culinary world and each chef’s station featured their versions of iconic street foods from various parts of the world including, Vietnam, India, Italy, Mexico, and the US. In addition to the selection of international delectables and open bar there was an auction featuring experiences like: “A Bartenders Dream”-assortment of world class spirits; “Big Apple Bonanza”-Two passes to the 2010 Big Apple Block Party featuring gift certificates from renowned ‘cue joints Blue Smoke, Dinosaur and Hill Country; and “Vietnamese dinner for four at home”-prepared by Institute of Culinary Education chef and South-East Asian cuisine expert, Erica Wides. 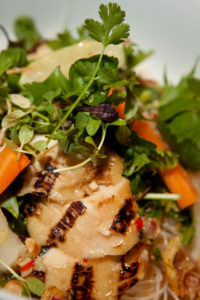 Chef Erica Wides also gave the guests a preview of what they’d win by giving a short demonstration of her cuisine as she prepared the delicately powerful flavor of “Caramel-Grilled Chicken over Rice Noodles, Asian greens and Herbs with Nuoc Cham. All this in addition to the Hoi An Spring Rolls she presented at the VIP reception. The Streets International Event was an evening of taste, culture and education that brought a slice of Vietnam to New York. 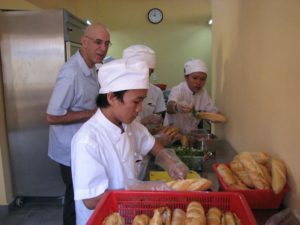 Streets will soon be spreading their goodwill and knowledge to neighboring countries Laos and The Philippines through the expansion of their program in those countries.